This will be the reverse stack, since all connectors will be below grade and one connector will be 2 levels below grade. While all other BW8s go up, this one goes down. The main reasons is cost, of course. Existing Beltway 8 is already below grade, which facilitates connections below grade. Also, just north of the Westpark Tollway corridor is a high-voltage right-of-way with a large number of power lines. Building elevated ramps would have required costly relocation of the high voltage lines and towers. 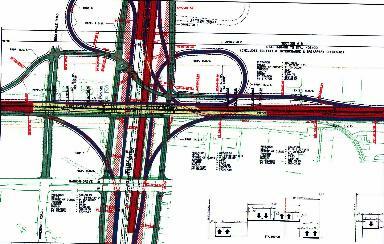 The only real problem with this planned interchange is the two cloverleafs. Just when I thought all cloverleafs in Houston had been destroyed, these two new ones will be built! For larger views of the schematic and details on the connections, go to the Westpark Tollway page. Looking towards the north at the location of the interchange with the Westpark Tollway. The Tollway will be in the same location as the existing railroad bridge, except that it will be elevated one level above grade. Notice the heavy concentration of high voltage power lines. Photo taken August 2000. Schematic view of the new interchange.